Balinese culture has long fascinated me, from my first visit in 96 until the present, in which I call Bali home, the integration of daily life and the local Hindu religion is something that I am always reading and learning about, as well as watching it everyday! Although I have lived in Indonesia since 2007, I have not had the opportunity to fully experience the Balinese “New Year” celebration before. 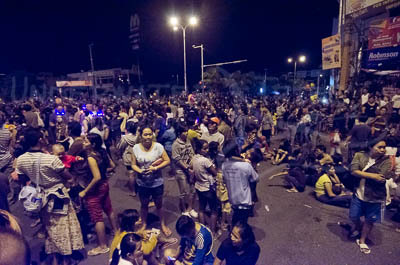 The name of this celebration is called Nyepi and means “day of silence” and like other new years celebrations in other parts of the world, it’s the biggest party of the year! Its basically a three day ceremony and involves the day of the Ogoh Ogoh (more on that in a bit), a day of silence, and a day of forgiveness. Basically, after 12 midnight of the first day the entire island goes black, electricity is not allowed and everyone needs to be silent for the next 30 hours until 6am of the following day! Yes, the entire island shuts down, including the airport, no flights come in or out of Bali on that day, no one is allowed out of their homes or hotels, and all shops are closed. Hotels do have electricity and obviously they do have some lights on but everyone, including tourists, are requested to respect the holiday by being discrete and quiet throughout the day. Only “village security” and emergency vehicles are allowed on the streets during that period. 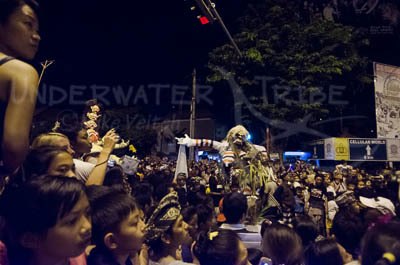 However, the coolest part of the Nyepi festivities has to be the Ogoh Ogoh parade. What is an Ogoh Ogoh you may ask? Well, it’s a paper mache monster that each village spends many months lovingly constructing, in often massive proportions! 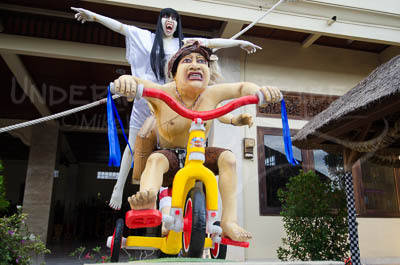 The Ogoh Ogohs are meant to manifest and embody bad spirits that have taken up residence on the island over the year. During the Ogoh Ogoh parade residents shake and prance with the Ogoh Ogohs in order to force the bad spirits up and away from the island. After hours of prancing the Ogoh Ogohs along the streets, many of them congregate on the beach for a final “push” where many of these statues are destroyed or even burned. Once the bad spirits have been chased away everyone turns out their lights and remain silent in order for the bad spirits not to see an opportunity to come back to the island. By keeping the lights off and remaining quiet, the people hope to convince the spirits that there is nothing to see and therefore the bad spirits will go elsewhere to settle. As this was my first time really seeing the Ogoh Ogoh parade, I was absolutely amazed at how many people were there. I joined many of my friends at the McDonalds corner in Sanur, along with what must have been 100,000 of our closest friends! 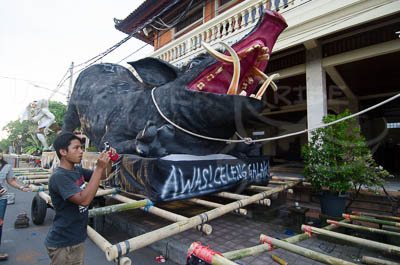 Hundreds of Ogoh Ogohs were paraded past by excited and joyful locals who were obviously having a great time. We were surrounded by lots of young children who were watching the parade with a great sense of fun and adventure. The whole night was one big street party (the roads were closed to traffic by around 730pm or so) and there was absolutely no hint of testosterone in the air like is usually found in western cities during big street parties, the police in the area were having a great time watching it along with everyone else, we could watch them taking a lot of photos with their cell phones.